1. Cook and shred chicken then blend in small mixing bowl with other ingredients. 2. 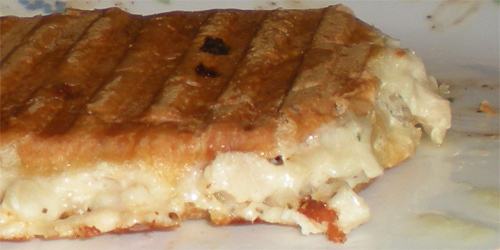 Heap onto bread and grill in panini press. You could also lightly butter french bread and grill in a skillet (`a la grilled cheese) or broil open-faced. 3. Serve with salad and fruit. Oh.My.Goodness. She is so squishy sweet! We need to have a play date soon! Oh My! That looks Delicious. I’ve wanted a panini grill for a while. Sounds (and looks) like fun!